Places to see at Guptipara: The biggest attractions of Guptipara are the four Vaishnava temples of Brindabanchandra, Chaitanya, Krishnachandra and Ramchandra which offers great pieces of architecture. 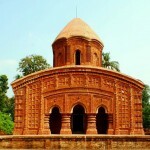 Nearby attractions from Guptipara: Among the nearby attractions from Guptipara, you can visit Bandel, famous for Bandel church as well as Kalna town and Bansberia. Things to do in Guptipara: The best thing that you can do while in Guptipara is sight-seeing of the four main Vaishnava temples. Plus, you can also take part in the different local celebrations like Rath Yatra, Ras, Bhandarloot and Dol. Rath Yatra is a grand affair in Guptipara with thousands of devotees taking part in the procession. How to reach Guptipara: You can board the Howrah-Katwa local that takes some 1 hour and 45 minutes to reach Guptipara. Then, you have to take a rickshaw that will charge you some Rs 100 from the railway station to the temples. State Highway 6 would take you to Guptipara from Kolkata via Jirat. Best time to visit Guptipara: You can visit Guptipara during anytime of the year. Lodging and dining facilities at Guptipara: Guptipara is popular as a day trip destination. So, staying there is not necessary. However, Guptipara offers a good collection of places to eat.